Why is it the broom is such an iconic figure in witchcraft? When I say the word witch, that is inevitably the first image to pop into someone's mind. It's so iconic that almost every book or movie with witches features a broom. My favorite is probably the scene from Hocus Pocus where the sisters fly away on other cleaning tools, including a vacuum. I laugh. Every. Single. Time. So where did it all begin? Commonly referred to in witchcraft as a besom, the broomstick was an important fixture in homes throughout Europe and other parts of the world. It was usually made of wood and straw and used, of course, to sweep the floors. The broom represented the epitome of female domesticity and was the perfect object of rebellion for women stuck in an extremely patriarchal world, but we'll get to that in a moment. One of the earliest known ritual besoms was believed to be made from Hazelwood and birch twigs, both trees sacred to the pagans. They were not very useful for cleaning and needed constant repair, so instead they were often placed by the door, bristles up, to ward of evil spirits and negative energies. Due to its use as a cleaning implement, the broom quickly became associated with the cleansing of negative energies and was later used in handfasting ceremonies to represent new beginnings. But that doesn't explain why the broom became a symbol of flight. The first known reference of witches riding on brooms was confessed by a suspected male witch in 1453 by the name of Guillaume Edelin of Saint-Germain-en-Laye. After being tortured, he confessed to signing a compact with the Devil and attending the Sabbath "mounted on a balai," or broom. This is the first known reference to witches riding on brooms. But the story doesn't end there. "At these magical assemblies, the witches never dailed to dance' and in their dance they sing these words, 'Har, hard, divell divell, dance here dance here, plaie here plaie here, Sabbath, Sabbath.' And whiles they sing and dance, ever one hath a broom in her hand, and holdeth it up aloft." When you combine Edelin's confession with early pagan rights, the picture begins to become clearer, but this is only part of the story. The use of hallucinogenic plants, later popularized by Shakespeare, completes this epic tale. "In rifeling the closet of the ladie, they found a pipe of oyntment, wherewith she grease a staffe, upon which she ambled and galloped through thick and thin." "But the vulgar believe, and the witches confess, that on certain days or nights they anoint a staff and ride on it to the appointed place or anoint themselves under the arms and in other hairy places." It cannot be known whether these accounts are valid or not as the history of witches were often written by inquisitors, ecclesiastical judges, and the testimony of accused and tortured witches, but if what they say is true where did the idea of flight using ointments and brooms come from? In 1477 the Witch of Savoy, Antoine Rose, confessed while being tortured that the Devil "...gave her a stick, 18 inches long, and a pot of ointment. She used to smear the ointment on the stick, put it between her legs and say 'Go, in the name of the Devil, go!" The idea that these ointments could cause feelings of flying is confirmed with modern accounts and science. Modern science and accounts of tropane alkaloids use shows that intoxication usually puts the user to sleep in which they experience flying and dancing. In 1966 Gustav Schenk recounts, "At the same time I experienced an intoxicating sensation of flying...I soared where my hallucinations - the clouds, the lowering sky, herds of beasts, falling leaves...billowing streamers of steam and rivers of molten metal - were swiling along." After Rose's confession, rumors spread far and wide and the idea that witches rode on broom planted itself firmly in cultural memory. 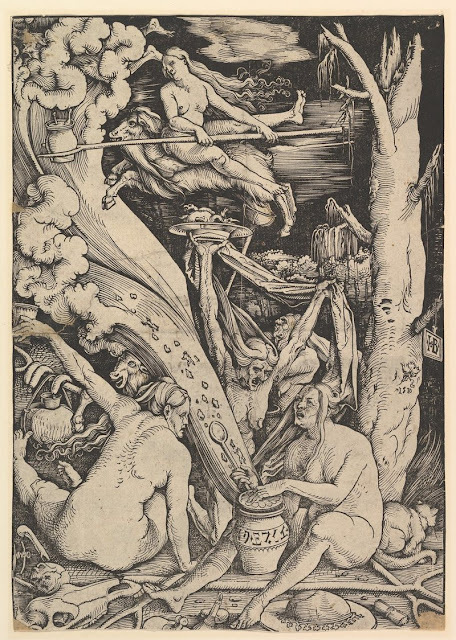 During the Renaissance artists like Albrecht Durer, Hans Balding, and Parmigianino began depicting witches naked and flying, sometimes on a broom and other times on a phallus. By the late 16th and early 17th century, witches riding up and out of chimneys begin to dominate popular art. And there you have it, the wonderfully colorful history of the broom and witchcraft. 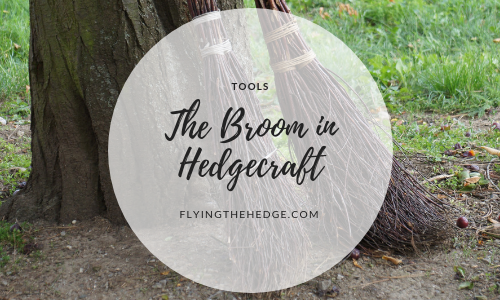 The broom is still a major fixture in witchcraft today, including hedgecraft. Hedgewitches often use a broom during hedge riding to aid in travel. Other times, a broom may appear during a journey to allow the witch to fly between realms or quickly through a single realm. Hedgewitches will also use brooms for protection during hedge riding, placing the broom within their magic circle, next to them, or in their lap during a journey. Either way, the broom is still used today to symbolize flight and travel for witches, and that isn't changing anytime soon. Looking to learn more? Check out the following sources.